inject_hotmail.com writes "The results are in: it's faster to send your data via an airborne carrier than it is through the pipes. 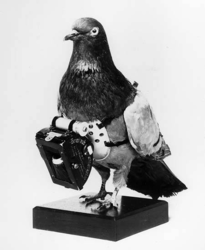 As discussed Tuesday, a company in South Africa called Unlimited IT, frustrated by terribly slow Internet speeds, decided to prove their point by sending an actual homing pigeon with a "data card" strapped to its leg from one of their offices to another while at the same time uploading the same amount of data to the same destination via their ISPs data lines. The media outlet reporting this triumph said that it took the pigeon just over 1 hour to make the 80km/50mile flight, whereas it took over 2 hours to transfer just 4% of that data." Reminds me of the old "never underestimate the bandwidth of a station wagon full of tapes hurtling down the highway" quote.